Lawson State Community College and the Department of Health Professions officers two tracks for the Certified Nursing Assistant program. The first track as outlined below is the Certified Nursing Assistant/Home Healthcare program taught once each semester. The Nursing Assistant/Home Health Aide Program is a ten (10) semester hour certificate program designed to provide the student with the necessary theory and laboratory experiences for the development of skills required to qualify as a long-term care Nursing Assistant/ Home Health Aide. Emphasis is placed on the acquisition of skills in communications, observations, safety, mobility/body mechanics, personal and restorative care, and infection control necessary to care for patients and clients of all ages. Upon completion of this program, the aide should be able to apply the concepts and skills in areas required by the Omnibus Budget Reconciliation Act (OBRA) and the National Association of Home Care. Financial aid is available to qualified applicants for the CNA/HHA program through the Workforce Investment Act (WIA). WIA is a federally funded program that assists job seekers in obtaining employment. The estimated cost for Tuition, fees, and supplies is $1500. 3. Applicants are required to receive certain immunizations at own expense. I.E. influenza, measles, hepatitis - B. 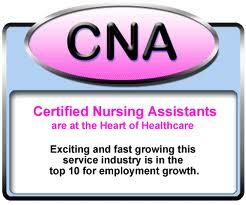 The second track offered is the Certified Nursing Assistant training course. The course is offered on the Bessemer Campus twice per semester. The class meets on Monday, Tuesday, and Thursday for 5 weeks from 4:00 pm until 10:00 pm. At the completion of the course, the student is eligible to sit for the Nurse Aide Competency Evaluation Services (NACES) certification examination. The estimated cost of tuition and fees is $655.00. The book and the workbook may be purchased at the Bessemer campus bookstore for approximately $50.00. Students will also be required to complete a Health Form and to receive certain immunizations at the student's expense. I.E. TB skin test and hepatitis-B. The Nursing Assistant Training course for the spring 2019 Mini-term 1 will be offered January 10 - February 14, 2019* and the Mini-term 2 will be offered March 7 - April 16, 2019. * Click here for a spring 2019 information sheet. The Nursing Assistant Training course for the summer 2019 mini-term 1 will be offered May 22, - June 26, 2019* and mini-term 2 will be offered June 27 - August 1, 2019. * Click here for a summer 2019 information sheet. Please contact Dorothy Young at (205) 929-3461 or dyoung@lawsonstate.edu for more information. *Dates and cost are subject to change without prior notification.